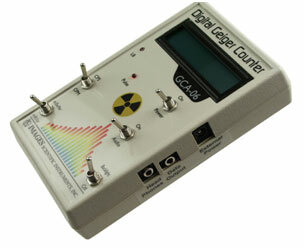 GM Tubes: Internal or External: In the internal Geiger Counter instrument, the Geiger-Mueller tube is inside the case, enabling one hand operation, leaving the other hand free. Figure 10 shows the GCA-06 internal model. For the external instrument, the tube is located outside the case at the end of a probe or wand and connected to the instrument via a cable, see figure 11. Figure 11 shows the GCA-06W with an external probe/wand. 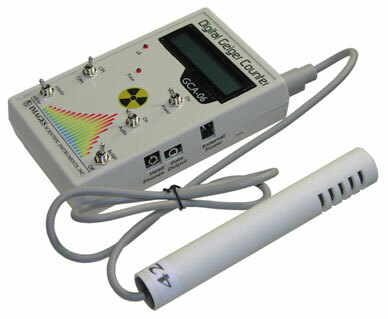 This kind of instrument is more suited for ‘probing’ radiation levels in tight spots. It's easier to move a probe around to check for radiation, then it is to move the entire instrument.